The accident scene at TransDiesel. 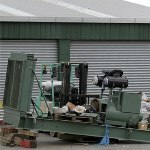 Police have released the name of a man crushed by a generator in a workplace accident on Hornby, Christchurch yesterday. Neville Raymond Sutherland, 30, was delivering a large generator when a forklift removing it from his truck toppled over, crushing him to death. Emergency services were called to the premises of TransDiesel Limited at Calgary Place in Hornby just before midday. Mr Sutherland died at the scene. A witness who did not want to be named told APNZ yesterday Mr Sutherland was standing between the forklift and the truck when the generator crushed him. “He had nowhere to go and would have died quickly. You would certainly hope so,” the witness said. Mr Sutherland, formerly of Kurow but a resident in Christchurch, was employed as a driver for Charter Transport. The accident is being investigated by the Department of Labour and police.